Since you are reading this you must at least be considering Aikido. The best way to find out what Aikido – Self Defence is all about is to come to try it out yourself, or at the very least, come watch a session in progress. All visitors are welcome, without being obliged to participate, even mid-way through the session. Beginners are always welcome: the sessions for the first weeks are FREE, in order for you to experience Aikido and to ensure that this school meets your training needs. Adults’ classes are open to all Aikido students of any grade starting from the age of 16. Everybody will practice at his / her own pace, even if your partner has more experience than you. 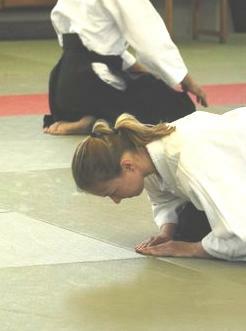 Techniques are presented in a way which allows the beginner to understand and learn the basic elements and techniques of Aikido. In a conflict situation, the body, posture and the mind are all vulnerable areas. Aikido is a self-defence system based on exploiting the weaknesses of an opponent by turning the opponent’s power against them using the exact degree of control required to neutralise their energy without inflicting undue harm or injury. When practiced regularly, it will develop a fitter, suppler and stronger body with improved flexibility, reflexes and reactions improving even your everyday lifestyle. Students will follow a structured program by qualified instructor (Sensei) being certified from the Aikido World Headqu arters, Japan, based on both individual needs and Aikido technical syllabus which will provide the student a gradual progress in his / her Aikido study. In the first few weeks you will learn step by step how to fall safely when you get unbalanced, divert and reverse an attack, escape from holds and apply simple but very effective counter offensive techniques that will give you an advantage that you never thought possible. Wear something loose that is not going to hinder your movements: such as tracksuit bottoms and a plain T-shirt. Remove all jewellery and hair clasps for safety purposes during the classes. Empty your pockets from everything, such as wallets and mobile phones (which must be switched to silent mode). So you found the dojo (training hall) and you have your tracksuit on, what next? Take your shoes off before walking onto the mats as training is barefoot. If you look around most people will be getting ready, changing into their keikogi (training uniform). Follow everyone else onto the mat and line up on the far left as the students having a higher would be towards the right end. All students would be facing the founder portrait, the Sensei move to centre who begins the session by kneeling down for meditation, then bowing to the founder and to students. The students do the same. Then the warm up follows. It is a regime of aerobic work and movements of most the joints of the body especially the wrists as these are used in most techniques. These exercises stretch and loosen the joints in order to prevent any damage whilst practicing techniques. Breathing exercises are also included. All one has to do is to follow and replicate what the Sensei does. The Sensei will gather everyone around and demonstrates a really simple technique against one of the higher grade students. Everyone splits up into pairs to try it out. You would probably realize that is not as easy as it seems, but do not get discouraged as the Sensei will come around to show again how it is done. Once you decide to begin training, you should expect it to take two months to be comfortable with the basic movements. The more you practice, the faster you will gain fitness, awareness and confidence. Ideally students should plan to take any two classes a week from the three available for a realistic progress.